Metsubo Jamir inaugurates the water booth at the New Market junction in Dimapur, on Saturday. Dimapur, Feb. 9: The minister for Urban Development and Municipal Affairs, Metsubo Jamir, inaugurated on Sat. 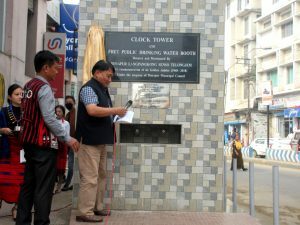 Feb. 9 a newly constructed ‘clock tower-free drinking water booth’ at the New Market junction, in Dimapur. The water booth was constructed by the Dimapur Langpangkong Senso Telongjem (DLST) in the aegis of Dimapur Municipal Council (DMC) to render basic utility to the public in Dimapur. One of the organisation’s members declared the facility as the DLST’s golden jubilee gift to the people of Dimapur. Langpangkong union will manage and maintain the utility service. Speaking at the inaugural function, Jamir acknowledged the contribution of the Langpangkong union for the development. The minister urged all sections of the people to emulate the good work shown by the union for the development of the commercial hub. Maintaining that Dimapur was a small city inhabited by various tribes and communities from Nagaland, Jamir admitted that despite differences in nature and opinion, the people of Dimapur had been coexisting in harmony. The legislator urged every citizen in Dimapur to come together and engage in noble work for the welfare of the society. Meanwhile, the administrator of the DMC, Moa Sangtam, who also spoke during the function, expressed gratitude to the organisation for their contribution. Stating that the Langpangkong union had shown a good example to other citizens in the city, Sangtam said that it was one contribution which proved that any organisation or society, as well as every inhabitant can contribute for their own welfare without always depending on the government for help. In another event, Tovihoto Ayemi, advisor to the Power department inaugurated the recently repaired Kalibari Road at West Yard colony in Dimapur. Speaking at the inauguration, the advisor said the the People’s Democratic Alliance (PDA) government had been giving its best to be a government of the people and for the people of Nagaland. “Whatever developmental activities that the PDA government had initiated, you have seen it. You will also get to see many more developmental activities in the future,” Ayemi asserted. Metsubo Jamir, who had inaugurated the drinking water booth at New Market junction earlier , also attended the road inauguration event. Speaking at the event, the minister for Urban Development and Municipal Affairs gave his word to repair the GS Road—starting from Dobhinalla Road, stretching towards Marwari Patti. It may be mentioned that the Kalibari Road was constructed by the DMC. Speaking to reporters during the sidelines of the inauguration programme, Badal Bhadra, the engineer who was involved in planning and designing of the road, informed that construction started in May 2018. According to Bhadra, the average length of the road is 824 metres, with the width measuring 8.7 metres. Bhadra mentioned that the road was built with a budget of INR 94 lakh.